There's a common belief that writers are a lonely lot. They tuck themselves away in remote cabins, huddle over computers at isolated tables near bathrooms at local coffee shops. They write in basement offices, surfacing only to stumble into bed and return at dawn to dark caves before the first glimmer of light (maybe that's why there are so many vampire books). I confess. I've succumbed a time or two and made the myth my reality. I've started writing when the sun rises, toss in a break or two to pet the dog, slap together a PBJ, and check if a gargantuan royalty check magically arrived in the mail. Eventually, I realize the sun set and the family is without dinner (or even groceries, for that matter). To be honest, the reason I've made it to the end of manuscripts is because I had to spend a lot of quality time with only me, myself, and I. "Mrs. Extrovert ... meet Mrs. Introvert. She's been called in by the"Word Count Police" to take over for a stint. We understand you've been out and about having way too much fun lately. Tennis, traveling, gardening ... hmm ... coffee and wine with friends (not at the same time), painting? Oh, doing laundry, paying bills, cleaning house, running errands ... all good things -- necessary for sanity and keeping the home afloat. But your word count progress is suspiciously lagging, and by last check, you are an author, aren't you?" Yes, I've had this conversation many times -- in fact, over today's morning coffee with me, myself, and I. It's a constant wrestling match. The writer who likes to saddle up to the computer and go on a marathon ride with the latest manuscript and the writer who loves to be out and about, tossed in the mix of activity, engaged in fascinating conversations, and making new friendships at book clubs, writing conferences, speaking events ... the list is exhaustive. It's balance. It's compromise. It's shaking hands at mid-mat and allowing each to take center stage and have a glorious moment before acquiescing to the other. It's feeding the soul with the right mix to sustain creativity, productivity, and enjoyment in the writing journey. After all, this is a pretty cool career in which I get to make up stories ought to be fun! So, figure out what works for you. The recipe is different for everyone. High altitude adjustments (Colorado girl talking here!) need to be made when the writing falls flat or is in a sad state of atrophy. Maybe a dash more of interaction with others to actually laugh, love, and live. Maybe a splash of discipline to hide the phone, ignore social media and emails ... or heaven forbid ... even use the word, "No". Whatever it takes, find your writing mojo. What's your secret recipe? Oh, please, do tell! Jayme H. Mansfield is an author, artist, and educator—and feels a bit incomplete when she’s not juggling all three balls. Her award-winning novels, Chasing the Butterfly and RUSH are book club favorites. RUSH is the Gold Medal Illumination Award winner for Enduring Christian Fiction. The novel is a finalist for the Selah, Excellence in Editing, and Colorado Book of the Year Awards. The story garners attention and five-star reviews from readers fascinated with history and its telling through story, steeped in detailed research and fact. The novel provides a tension-filled, moving tale of a pioneer woman’s determination to survive and is based on the life of Jayme's great-great grandmother. 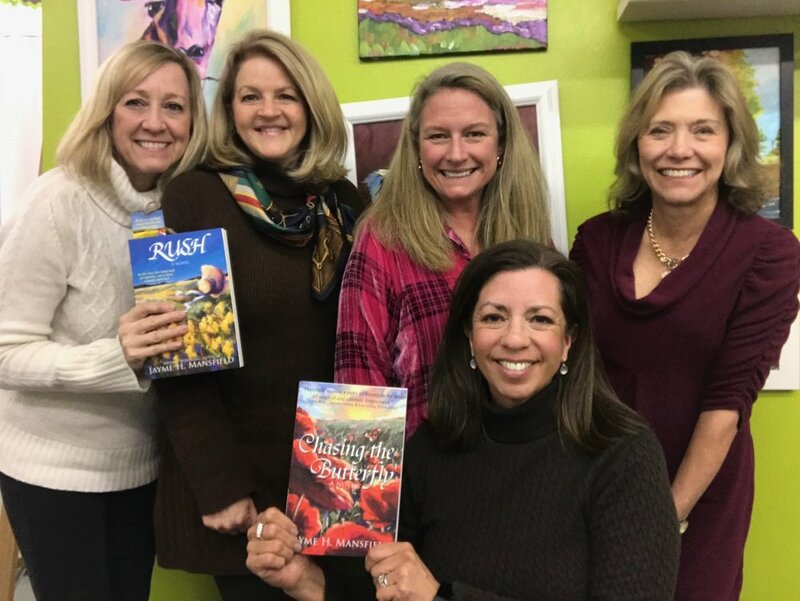 A recent manuscript, Seasoned, is the first place recipient of the 2017 Blue Ridge Novelist Retreat Golden Leaf Award for “Excellence for an Unpublished Novel.” Jayme meets several times a month with book clubs and speaks at a variety of literary, art, and educational events as she shares about the power of art and creativity that is the common thread in her novels.